Ivana Adaime Makac at Le Bel Ordinaire art contemporain, Pau. Ivana Adaime Makac, Le Banquet (2008-2017). Pedestal, fruits, flowers, vegetables, locusts or crickets; variable dimensions. Photos: Marc Dommage, Ivan Binet and Ivana Adaime-Makac. Ivana Adaime Makac‘s ongoing work Le Banquet will be featured in the group show Enchanter le réel, curated by Claire Lambert at Le Bel Ordinaire art contemporain, Pau, from September 13 through November 18, 2017. The exhibition explores how the imaginary architecture oscillates between pure fiction and utopia. The artists are invited to reflect on how, as human beings, we both inhabit and are inhabited by the habitat. 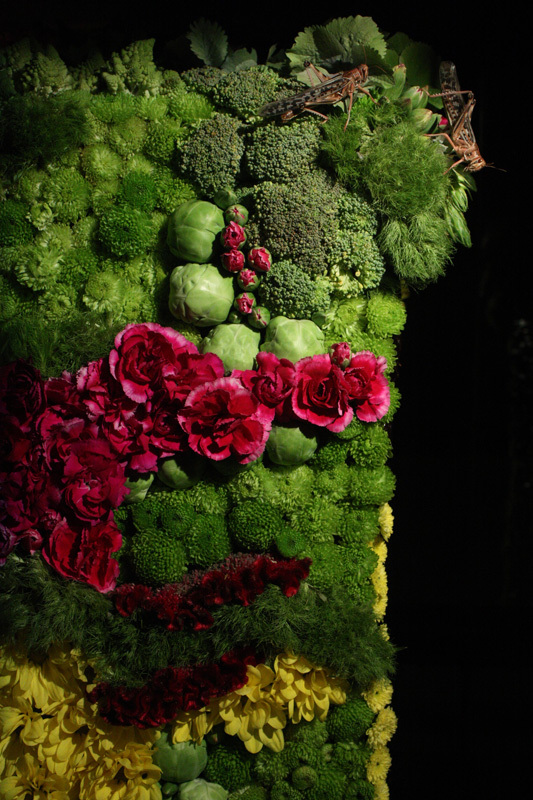 In Le Banquet, Adaime Makac reverts the process by inviting insects to taste sculptures and structures composed of fruits, flowers, vegetables and different types of food. Artists: Ivana Adaime Makac, Michel Blazy, Alain Bublex, Benedetto Bufalino, Frédéric Chaubin, Filip Dujardin, Nicolas Floc’h, Yona Friedman, Taro Izumi, Béranger Laymond, Marine Pages and Peter Wüthrich. For more information on Ivana Adaime Makac and Le Banquet please click here.